counter tops, stainless appliances, front-loading washer/dryer, and all the comforts of home. 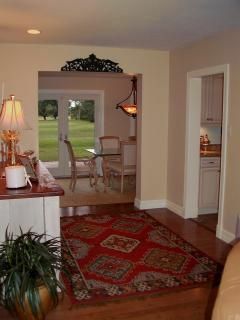 Walk-out to golf course, club-house, golf-course pool, plus great walking and biking area. We include bicycles, beach towels, beach chairs, beach umbrella, travel cooler, and anything else you need to go to the beach or pool. Golf club rental available at club house - so you don't need to bring anything. However, we do have a set of golf clubs in the shed if you would like to use them. There is also a large, 72" gas grill on our deck for outdoor cooking. This home is on the 13th green of the lovely Ft. Myers Golf Course, just off Historic McGregor Blvd, shown in some of the photos. This property is so wonderful! The house is everything you need. Lots of events you can ride bikes to. Beaches close by: Sanibel, Fort Myers Beach and causeway. You can relax on back porch and grill out. Many places to go dine out nearby! What more could you ask for?! My Aunt and I have rented Tiffany's lovely cottage for at least 5 years during the holiday season. It is perfect, relaxing, well appointed, and has awesome views. Relaxing on the deck with a view of the golf course is a great way to start and end the day.